Some big changes are coming to call-to-action buttons on Facebook Pages, including new third-party and Messenger integrations, the social network announced. Facebook is also rolling out a new recommendation feature that could help more people discover your business Facebook. Here’s are three changes to Facebook and Pages that you need to know. Start Order: Lets your customers place orders via delivery.com or Slice. Book Now: Lets your customers book appointments with your business via HomeAdvisor, MyTime, or other services. Buy Tickets: Lets your customers buy tickets to your events via Eventbrite or Ticketmaster. See Showtimes: Lets customers see show schedules and buy tickets via Fandango. To take advantage of these new integrations, you’ll have to update your call-to-action button and go through the process of adding a third-party service. “Content Marketing: A 360 Degree Approach”. Is your content marketing strategy giving you the results you want? There may be strategies you are overlooking. A Free Webinar by AdLift Inc. on November 9th. 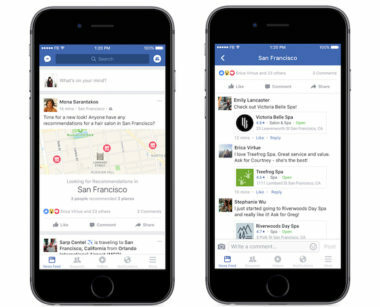 Facebook has added three new call-to-action buttons that have been integrated with Messenger. Whenever someone clicks on one of these buttons, it will create a new Messenger thread. Get Quote: Customers can request a quote for your service (Facebook noted that availability of this button is limited globally). Request Time: Customers can request a booking (only available in the U.S. if you’ve added a Services section to your Page). Shop Now: All Pages can showcase products for people to buy from the Shop section (Facebook added that they will also soon let you tag posts with products from the Shop section). Imagine you’re going on a trip to a city you’ve never visited before. Or perhaps you want to do something fun or need to buy something locally, but you don’t know what to do or where to go. Have you ever asked your Facebook friends or groups for their recommendations in either of these situations? Well, now Facebook is making it even easier to do just that with a new Recommendations feature. Then, your friends can leave comments with suggestions. This includes an option to let them mention a relevant Facebook Page with their comment and also add their recommendations to a map. So make sure you’ve completely filled out the information section for your Page to ensure people can easily find you business whenever you earn a recommendation. All of these updates have just started rolling out in the U.S.